I had this LARGE version of DARK HORSE'S Bettie Page Statue professionally repainted from the boring black highlights shown in the untouched, original version. I was advised by the artist that there are at least 15 recoats applied to get the candy apple rich color and texture. 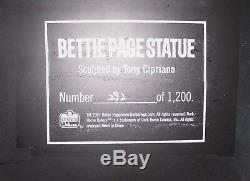 This is a one-of-a-kind rendition of the famous and scarce statue, sculpted by Tony Cipriano. On stand, over 13 inches tall. The stand has also been repainted and this particular statue is marked 292 0f 1200. Original box is included (fair condition). Please see all photos to appreciate the attention to detail. This statue has been displayed under glass since its acquisition. It has never been damaged or repaired. Beautiful to gaze at and is a wonderful addition to any Bettie collection. The statue will be securely packaged so that it arrives in the same condition as when it left. The item "L@@K Repainted by Artist One-Of-A-Kind LARGE Bettie Page Statue (Dark Horse)" is in sale since Friday, September 7, 2018. This item is in the category "Collectibles\Comics\Figurines". The seller is "cavel49" and is located in Cornwall, Ontario. This item can be shipped to United States, Canada.